I love this time of year. The cold crisp evenings, heavily scented with wood smoke, are spent sipping on a noggin or two of whisky all rugged up in someone cosy. Few know of the delights of North Queensland where, while the south shivers, one can sleep with windows open and ceiling fans quietly whirring. You’re interrupted only by the occasional noise of passing wildlife in the rainforest just outside, and the only concern is what to have for breakfast. Do you feel a road trip coming on? 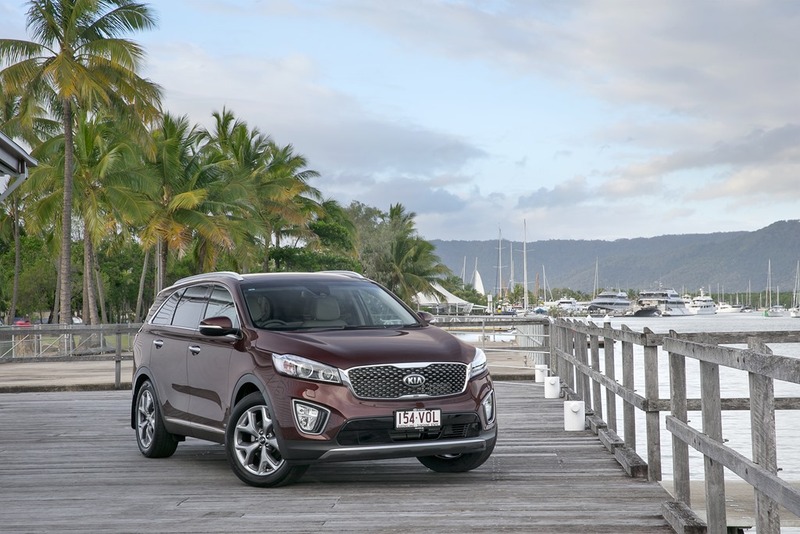 Maybe that’s why Kia launched their tasty new all-round good guy, the Sorento in stunning Port Douglas. The Sorento looks pretty good and not at all out of place in the fancy-schmancy world of a posh port overflowing with BMWs and Audis. 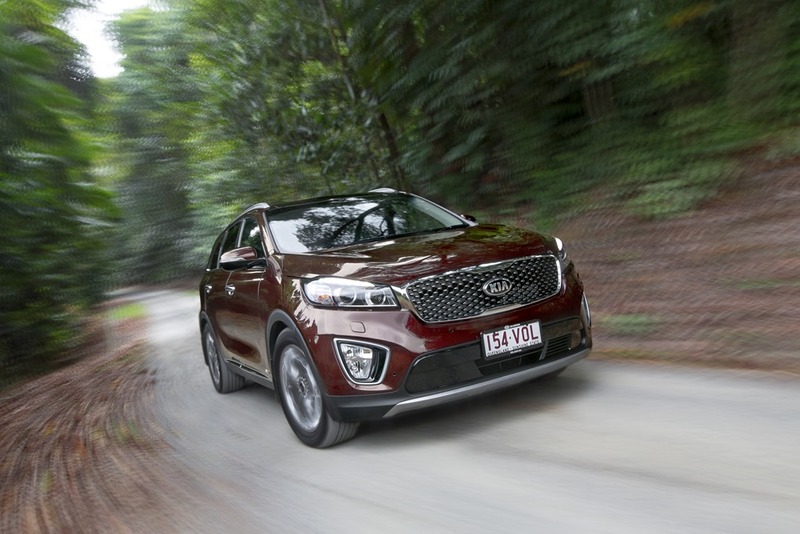 It’s big, however if it is interior space you’re chasing, the Sorento has the suave looks of a handsome Euro gigolo wrapped around a big tasteful cabin. The tiger-nose grill has a neat look with an infill field reminiscent of being inside the Enterprise looking out just as it goes into warp drive. The light clusters look expensive with LED illumination throughout festooned in fancy shapes. The door handles and side mirrors look as if they were nicked from a German’s parts bin which is not a bad thing by any means. This is no coincidence since the design was done in Korea with significant input from the chaps in Frankfurt. Remember the bloke who heads Kia’s design team is the one who used to pen Audi’s models not all that long ago. Noice! It’s noice, it’s diff-rent, it’s un-ewes-ual. The interior was done in entirely in Frankfurt and this no doubt accounts for its snappy, upmarket appearance. The top model has smart entry and start which I’d like to see range wide. I detest having to fumble about in my darkest recesses for the keys. You don’t even need them to open the rear hatch though, in fact you don’t even need your hands. After a hard day’s shopping, your arms will be full of David Jones, H&M and Zara bags , so all you need do is simply stand behind and wait for a few seconds. 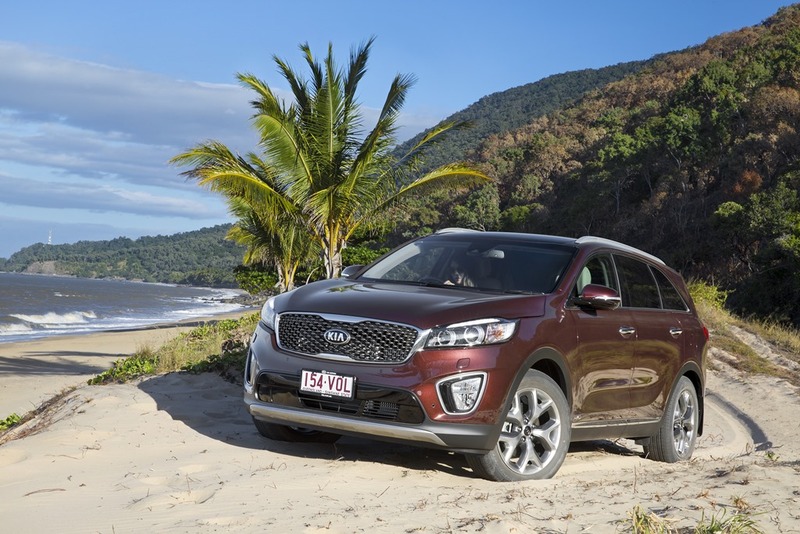 Sorento knows you’re there and gives you a couple of friendly beeps before she swing the rear door up for you without you doing a thing. You toss your stuff in, press the button on the bottom edge of the door, and return to the driver’s seat for a well-deserved take away latte. If you need more room, stowing the 2nd row seats is easy with a couple of release levers located in the capacious luggage bay. 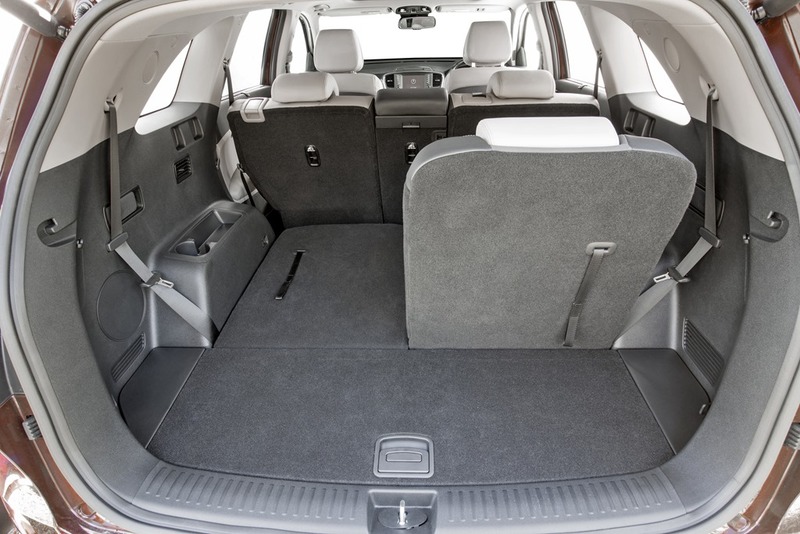 There is also a 3rd row of seats secreted under the rear floor. You can use them on those nights when you designate a driver other than yourself to remain stone cold sober. He will use your car to ferry you and the chaps between boozy, fun-filled venues and all-night pizza joints. I imagine you’ll feel jolly popular when mates know you can take more than five peeps in a single trip. It’s all good so far right? You’re expecting me to no have a whinge about this being wrong or that being rubbish or something else being cheap and nasty, but no not a bit of it. All of the surfacing looks and feels expensive. The plastic is the soft touch we get in more expensive cabins and the fabrics and leather looks quality too. The centre console has some cup holders and controls for the sports settings. The dash is covered with a sporty fabric on the top surface and some fake woodgrain on the front. We could probably do without that thought as fake woodgrain gives me the irrits. 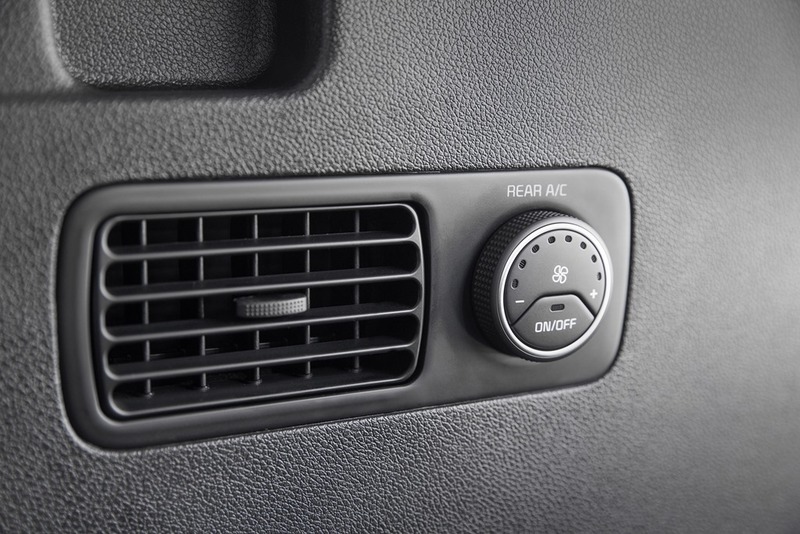 The centre stack zones are divided between climate control and entertainment. The system is easy to use and you pair your phone in a few simple steps. That’s very important and no doubt the first thing you’ll try to do and you get in. 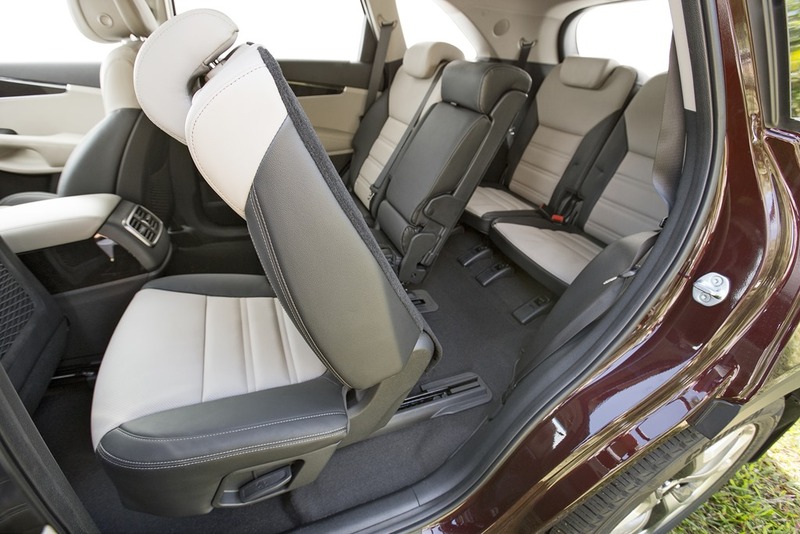 I thought the seats felt a trifle firm but Kia’s engineer explained this as necessary to satisfy the terms of a 7 year warranty. In other words the company wants to make sure they are as good at the end of the period as they were at the beginning of it. After a few days in the saddle I was used to it and found them comfy and supportive. Kia say they are designed to have good lateral support but I felt that I was sitting on it rather than in it. I put this down to having been in sports cars with racing seats for several weeks before this outing. A longer drive might settle the driver in properly, but regardless I never felt uncomfortable. I love the cabin. It is classy, and a quantum leap from the old model. But, how does it drive? 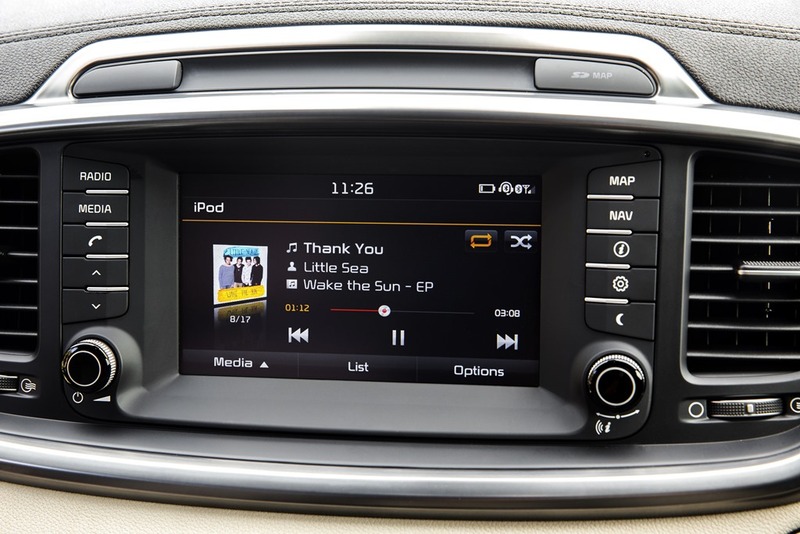 Many of us like the feel of a high driving position and you feel very high in Sorento. Kia has tried to keep the centre of gravity as low as they can in such a tall car, and it feels to have paid off. There’s no getting away from the fact that it is no compact sporty coupe that you’re driving. You only notice the size at first but this quickly becomes the norm for you as you put some k’s on the dial. The steering in Eco and Normal mode feels very light. 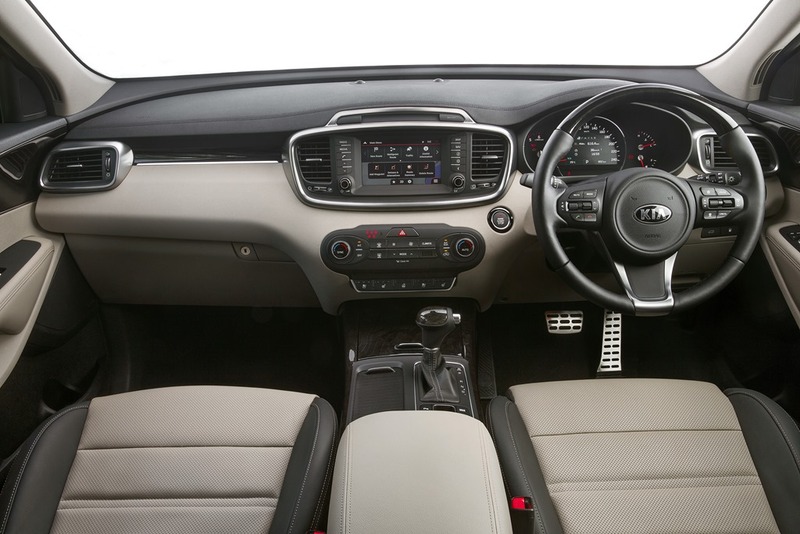 Kia have a new rack-mounted electric power steering system which has a completely different feel to their old models. The slightly aloof and wooden feel is gone, but in these Eco and Normal modes, road feel is less and assistance is more. Most people like a lightness to steering especially when parking. Again, once you’re used to this it feels great. Not too heavy or light. 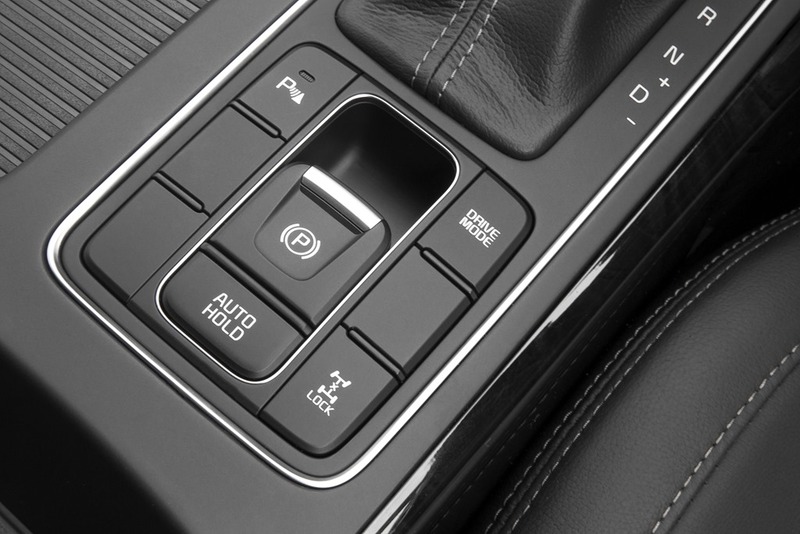 Switching to Sports mode holds the gears longer and changes the steering calibrations. In Sport mode the steering has much more feel to it. I’d love a programmable mode where you might have normal gears but sportier steering and perhaps that can come later. The ride was very smooth and unbelievably quiet. We bumped along on b grade roads with dirt and gravel sections with ease. This is about the maximum level of grief most SUV’s ever get, and Sorento handled it with much aplomb. There is a very long list of active and passive safety gear making the Sorento the safest SUV on the market with a 5 star ANCAP rating, but more about that at the end. All petrol are front wheel drive and all diesel models are AWD. That’s a shame because the new 3.3 199kw petrol is as smooth as a Barry White love song. It’s from the Lambda II family and I would buy it just so I could say “lambda II” at dinner parties. The R2.2 is a 2.2 diesel with 147kw/441Nm and has had the laying on of hands to give extra torque at low and mid-range. That’s very handy should you fancy a little light “off-road” work. There is a 2,000kg towing capacity and the tow bar has a 100kg downward pressure limit. Some say it needs more like a 200kg but remember that all depends on how the load is packed. That still means you can tow you Jet Ski on Saturday and your mother in law on Sunday. Win/Win. Sadly, because the silky 3.3 is not available on the top model you’ll only be able to buy the diesel. This news caused much hissing and spitting gallery, well actually it was only me who showed any distress. Surely walking into the Kia showroom, selecting petrol/diesel, 2WD/AWD, and Si/SLi/Platinum wouldn’t tax too many people? I liked this engine a lot for the smoothness and progressive delivery of power. The transmission is starting get on a bit in years, but remains smooth in its changes. The only gripe I have with it is it lacks a few extra cogs. Most brands are moving towards 7 and 8 speed autos now. This would also help the fuel figures drop from the current 9.8l/100k. It would be nice to have some paddles on the steering wheel too. 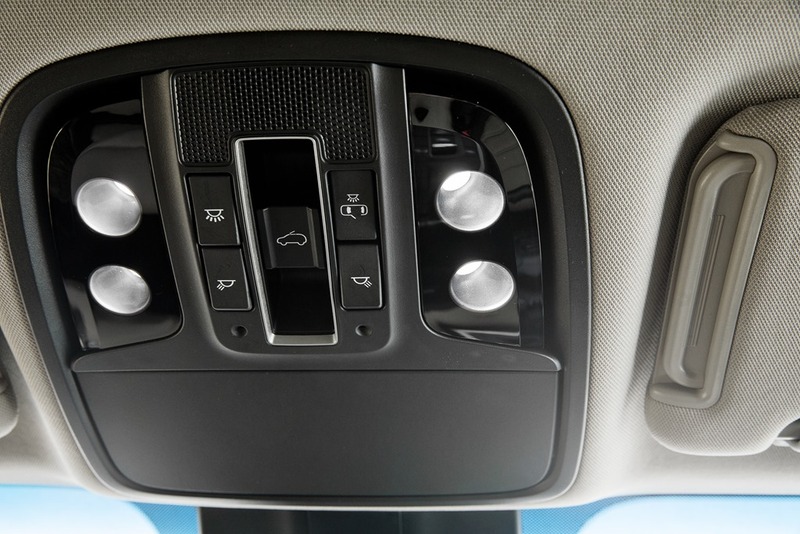 The smart cruise control slows you down if someone is detected in front of you. It won’t slow you to a stop as many other brands do so as you get to about 10kph you’ll need to take command. As we swept through the North Queensland countryside, the silence on most road surfaces astounded me. There seems to be just the right balance between hearing a pin drop and being so heavy with sound deadening material that the centre of gravity is about a metre above the roof. We moved from one corner to another gracefully and most bumps went unnoticed. The ride was nothing short of limo-like. 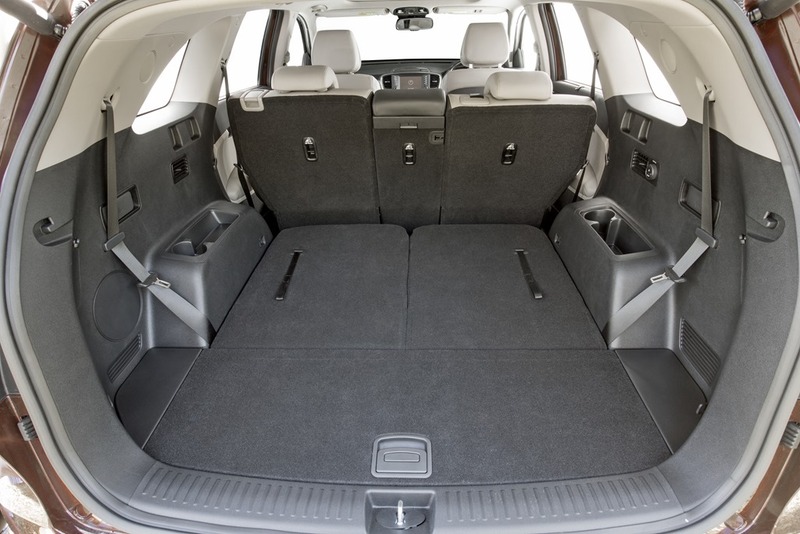 Whilst you’re in no doubt that you are in a big heavy car you are rarely bothered by excessive body roll even though this is an SUV not a sports car. 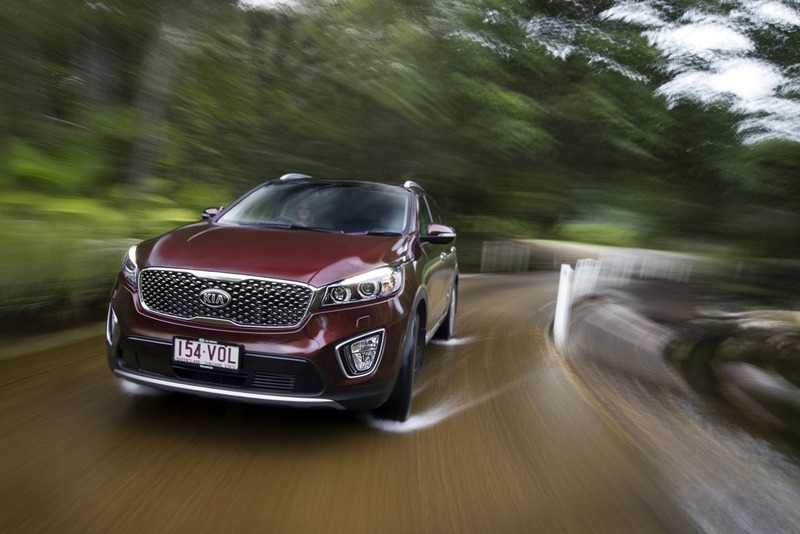 When compared to Ford’s venerable Territory, the Sorento feels light years ahead. Although the Ford may feel slightly nicer to drive, everything else about it feels old. The only comment I want to add is that the Infiniti Stereo in the platinum sounded good, but could sound better. It isn’t a big thing, I suspect this is because I had just been in a car which had a Bang and Olufsen system. Perhaps another spin in a few months may elicit a different response. Still, that is something for a buyer to decide. After you’ve finished your spin in the country, the Platinum will slide the driver’s seat back when you press the engine-kill switch. Nice! So, let’s wrap it up. If you hang around the CBD often enough, you’ll see an X5 or Q7 sneak silently past as you are standing at the lights. Do they think dark windows make the car harder to see? No in fact it makes people notice it even more as they try to have a sticky-beak to see who is sitting in the back seat. They have the “HC” number plates and uber-black privacy windows, so you know the car is important and has permission to be airside at Execujet. You might also postulate that the people inside are so important that they are ex-directory, and you know someone is paying an awful lot of dosh so they don’t have to drive themselves and can be “trollied” all day if they wish. 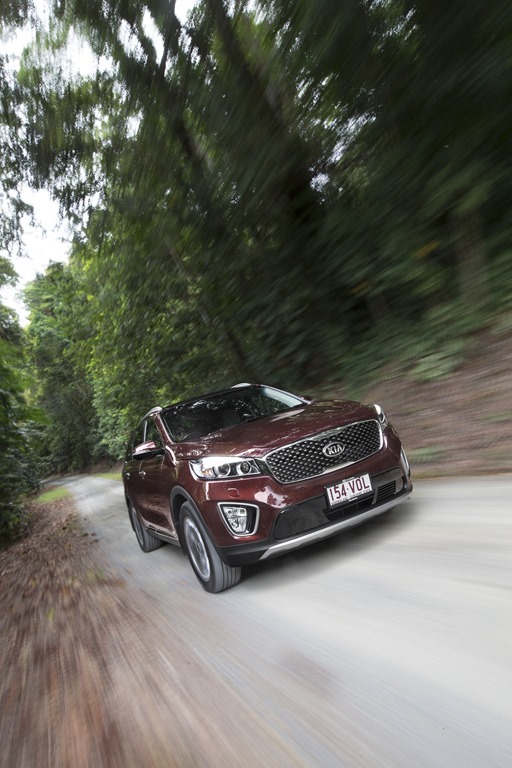 Since there are so many seats and the ride is so smooth, and the cabin so quiet, I wouldn’t be at all surprised if we see the odd Sorento parked up in the “we are too posh for to care” section of the driveway at the Four Seasons. It has the presence, so why not? 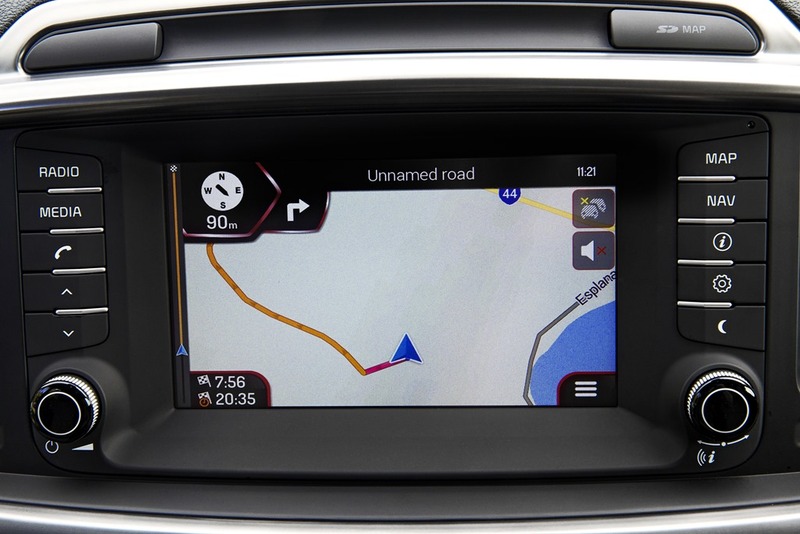 The top model is going to be around 60 grand on the road and at that price there are many other options but few will have this space and this many gadgets. Kia hope to sell 350 a month and if buyers can get over the badge envy, I can see this being realistic. But, what if the exec car services take to these as a less expensive alternative to the big Germans? After all Genesis is Hyundai’s answer to the sedan hire car market isn’t it? It isn’t too long a bow to draw. Watch this space. 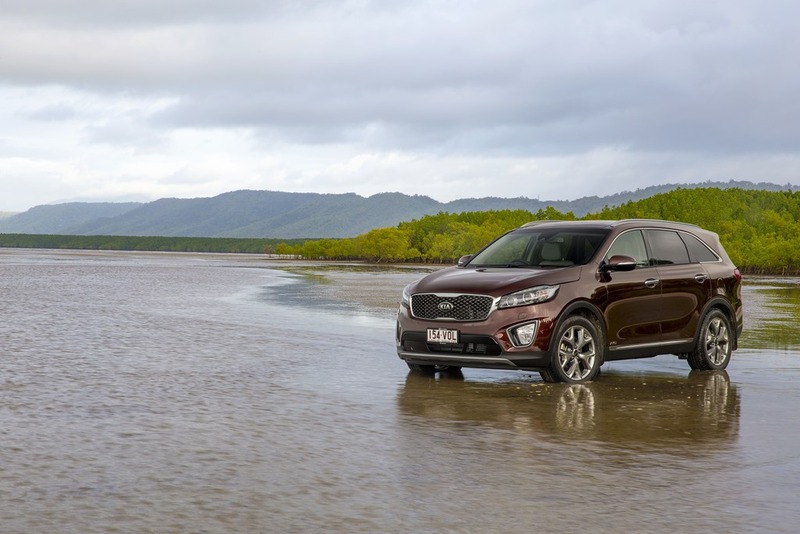 Finally, Sorento did not put a foot wrong and Kia is quite right to be so proud of their new baby. Some didn’t fancy the steering and others didn’t like the ride. Everything is relative and I’d love to know what they were comparing the Kia to because after 3 days I loved both. The steering feels light at parking speeds with lots of feel on the highway, and the ride is superb. The cabin is so quiet you can hear a pin drop and there are enough seats for a football team. I mentioned earlier the 5 star rating for Sorento. This was a Euro NCAP rating which ANCAP will accept without retesting. There are safety ratings organisations all over the world and all have differing requirements their rating system. So, a 5 star in Europe or the USA might be different to what we have here in Australia. On the whole, Australia’s ANCAP has slightly higher standards the Euro NCAP but over the next few years Australia and Europe will align. In the meanwhile Australia will accept Euro ratings and list Euro NCAP under Australian ANCAP, without retesting. Are you with me so far? Right, so, the crash test is only one part of the assessment. There are also certain safety features a vehicle must have in order to get 5 stars. 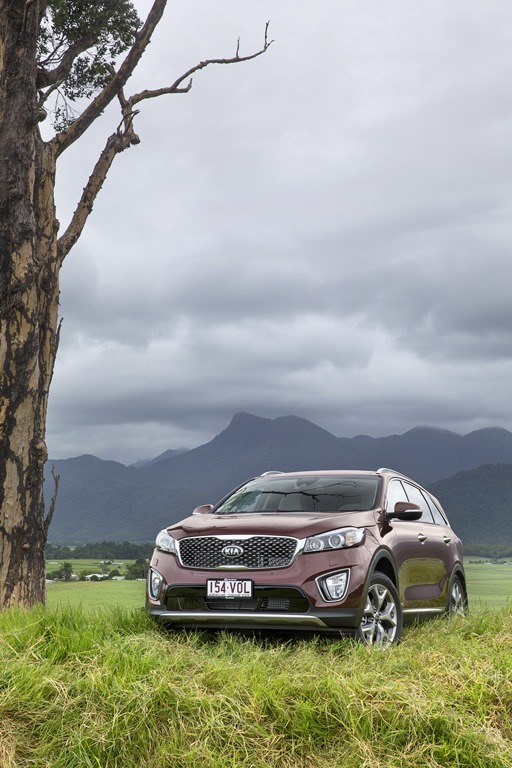 Since the Sorento passed the Euro crash test, and had many more safety features than required for either a Euro NCAP or Australian ANCAP 5 star rating, the 5 star rating didn’t need another test here. On that note, it is worth mentioning that the ANCAP standards change each year. A 2009 5 star car probably would not get 5 stars now. Ratings now come with a year stamp so you know where you stand and when your car got its rating. Not every car is tested every year. If the car you’re buying is new, but the model is a few years old, the 5 star issued originally may well be out of date. This is something we will follow up and report back to you on. It seems a sloppy way for the government to transition especially without properly informing the buying public. 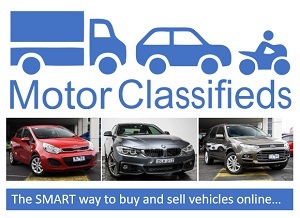 Many people buy their cars based on the safety rating and would be concerned if a car got 5 stars in Europe but only 4stars if assessed here. Again, this is not a concern and the Sorento would definitely get 5 stars if assessed under ANCAP because the crash tests are the same and Sorento has more than the required onboard safety gear. There is no reason why a left and right crash test would not get the same results. 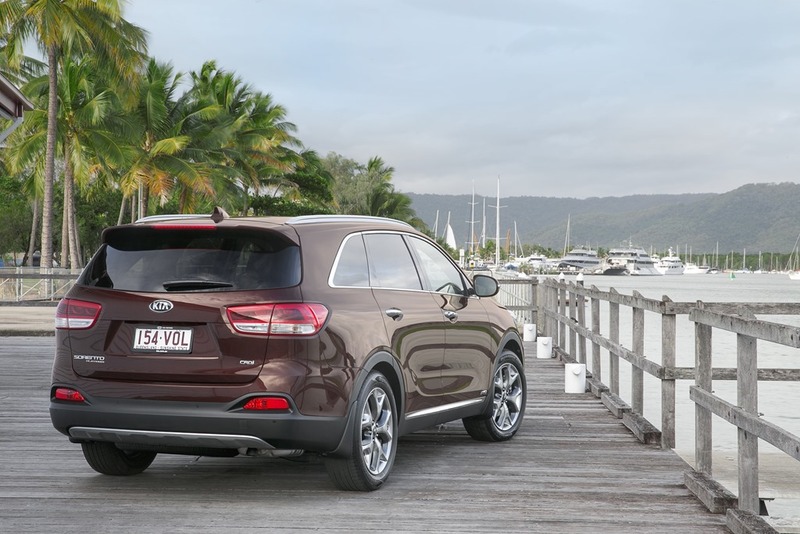 In other words, the 5 star rating of the Sorento is sound. Sure, why not? 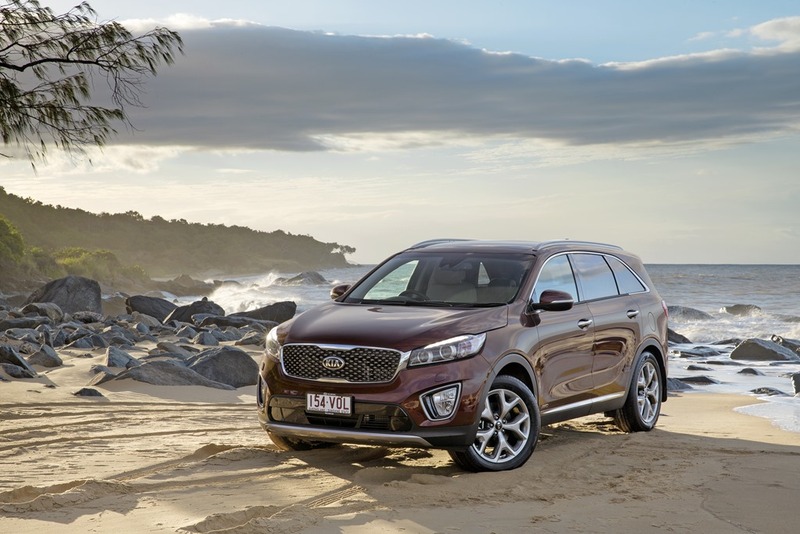 If I was to find myself in need of a large SUV, I’d happily have a Sorento. Transmission: Six-speed auto, front wheel drive for V6, all wheel drive for diesel. 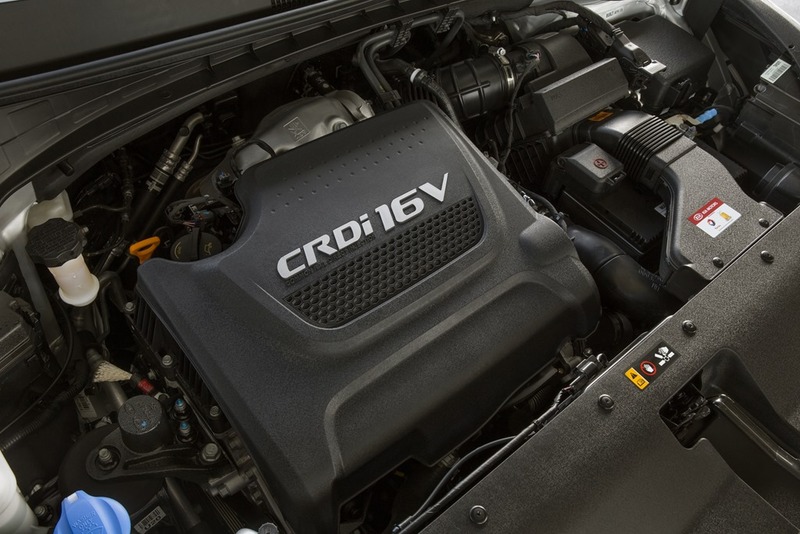 Power/Torque: 199kW/318Nm V6, or 147kW/441Nm. Fuel use: 9.9L/100km V6, 7.8L/100km diesel.